Are you struggling to lose weight? Then you’ve come to the right place! The 7 day GM diet is an effective meal plan that helps you lose 5 to 7 KGs easily after following it for a week. On the day 4 of GM diet, it is suggested to have Banana Milkshake and there is a good reason for that. Everyone thinks that Banana contains a lot of calories, but not many know the health benefits of eating Bananas every day. So, let us first see the pros of eating a Banana. P.S: Too much of anything is injurious to our health. Find the 1000 Calorie Banana and Milk Diet Plan. Since, the Banana is a calorie dense fruit; consuming just 1 banana will make you feel energetic instantly. So, it is very useful for those who’re trying to lose weight. It helps you feel full for longer periods of time. It is highly rich in Potassium and Magnesium, thus helps in regulating your blood pressure. The potassium content in the Banana promotes bone health. They’re rich in soluble fiber pectin; thereby help you in easy digestion of foods and eases out the constipation. They prevent kidney cancer and also protect the eyes from macular degeneration. They’re very high in anti-oxidants. Bananas, if had between meals are proven to stabilize your blood sugar levels and they also help in reducing nausea caused from morning sickness (very good for pregnant women). The above are just a few of the many health benefits of eating a Banana. It is not just the Banana! The stem of a Banana tree also has a lot of amazing benefits. Let us look into the facts now. The Banana stem contains many nutrients that are vital for a healthy body. Read the following facts to get an idea of how healthy the Banana stem is. In countries like Thailand and India, people don’t waste any part of the food. So, they don’t just eat the Banana, but also the stem and the flower. If we speak botanically, the Banana stem is actually considered as a flower stalk, and not a stem. The flower stalk grows in such a way that it supports the entire plant. People generally discard the outer layer of the stalk, but inside you’ll find a fibrous, edible food item. In many tropical countries, they’re used in curries and fried snacks. Having the Banana stem in our foods will prevent constipation and ulcer, as it contains sufficient fiber for our body. 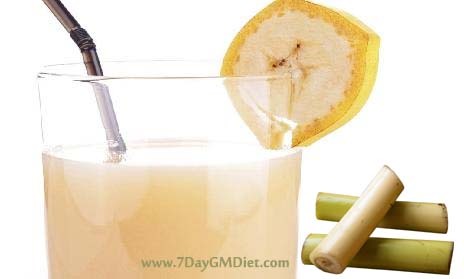 Is Banana Stem Juice Effective for Weight Loss? The basic equation of losing weight is very simple – burn more calories than you consume. So, taking a close look upon what you eat, can make a large difference. Since the Banana stem is rich in fiber content and low in calories, consuming it will make you feel full for longer hours and thus it is very good for people who’re trying to shed weight. The Banana stem contains a type of fiber which is efficient in eliminating fat from your body. The fiber content present in the Banana stem juice slows the process of releasing the sugar and fats stored in your cells into your bloodstream, thus helping you get a steady supply of energy. So, if you try to perform any exercise or HIIT workout in this state, then it will keep you rejuvenated for more hours and thus help in losing weight effectively. Like we said before, there are very few calories in the Banana stem juice and so you can consume it without worrying about the weight gain. The daily recommended amount of fiber is 25 grams. However, to lose weight fast, you can consume anywhere from 30 to 40 grams. As stated in Ayurveda, the Banana stem juice is very good for people who’re suffering with kidney stones. The diuretic properties of the stem juice are efficient enough to reduce the size of the kidney stones. How to Prepare Banana Stem Juice? Not many could take the banana stem juice in raw form as it doesn’t taste that good. So, you can blend it with a few other ingredients to make the taste better. Take a cup of buttermilk; soak the banana stem in it and leave it overnight in a refrigerator. When you woke up the next day, add a pinch of cinnamon and 1/2 teaspoon of sugar to the cup. Use a blender to make a thick shake. Soak the banana stem in 1 cup of water and leave it for an hour. Doing so will make it soft. Using a blender, make a juice out of it. Separate the fibers using the mesh sieve and add lime juice, sugar and a pinch of salt to the juice. Still well and serve chilled. Soak the banana stem in water for an hour and blend it to get the juice. Strain the juice using a mesh sieve. To the juice, add the Apple juice and a few ice cubes to serve it chilled. Note: You can replace drinking water with plain soda water and Apples with Mangoes in the above recipes to add much better taste to the juice. You can take this juice daily and there is no limit on the quantity too. So, have it whenever you feel a need of it and get rid of your obesity and kidney stones. Previous Post:How to Prepare GM Diet Wonder Soup aka Cabbage Soup? Next Post:How to Make Skim Milk from Raw Milk at Home?